Gardening in an urban area, apartments, rooftops and small yards. Information on city gardening, small gardens in a city, water gardens, tub gardens, container gardening, square foot gardening, aeroponics and tranquility gardens. Supplies for city gardeners. The daffodils are up and we already heard a robin singing here in Jersey City. Here's hoping winter doesn't roar back in. Anyway, I've started some favorites inside here. Check out the Garden Giveaway link (below the poll on the home page menu) for the largest collection of free to order seed catalogs that I've ever seen. The time is now to get your orders in. I've used the Jiffy Peat pots and plastic greenhouses again. You can find a picture and short review in the Reviews You Can Use section. 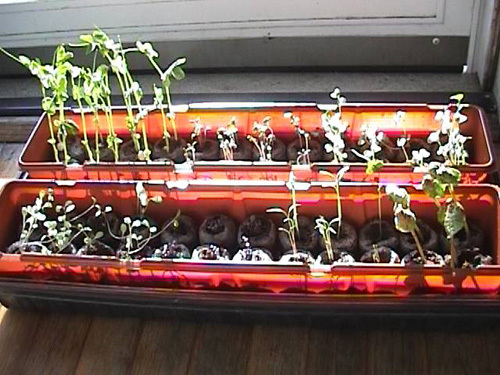 These work for leafy veggies, lettuce, chard, kale, even tomatoes and flowers. I would not try them with radishes or carrots though (anything that is a root veggie). i would use the small pots with soil for those. This year, I have started kale, chard, Snow peas, lettuce, purple basil, moonflowers and some cosmos inside. Kale and chard have proven to be very tasty, loaded with vitamins and can stand the heat of summer better than lettuce. (they don't go to seed as fast.) On order from Burpee are tomato plants (this year it's Big Boy tomatoes) and the sweet red pepper plants that did so well in the garden last year. The early tomatoes did not do so well in the garden last year, I suspect due to the colder weather we had in May and June. Returning in this year's lineup are the blueberries (two plants), blackberry (one), chives, some parsley, lavender and columbine. These spent the winter in the square foot box that was turned into a coldrame. Viewing the online poll here, it appears most gardeners are on their way with planning their gardens. Thinking and planning ahead always lead to a better season. You can schedule an early spring crop and have the next round of plants or seeds ready for summer or early fall. With a little pre-planning, you can extend your growing season from early spring well into the fall. Happy Gardening!